Today’s Groupon Deal of the Day: $19 for a One-Month Membership, Plus Two Personal-Training Sessions ($235 Value), or $25 for a $50 Gift Card to World Health. Choose from 10 Locations. This is a limited 1-day only sale that will expire tonight at midnight (Tuesday, January 4, 2011). Click here to buy now or for more information about the deal. Quantities are limited so don’t miss out! Limit 1 per person, may buy 2 add’l as gifts. Valid only for opt. and loc. purchased. Membership option valid for new members only. Gift card valid only for current members & returning clients; not valid toward membership dues or 3rd party tenants. For $19, new clients get a one-month membership at one of 10 World Health locations plus two personal-training sessions (a $235 total value). For $25, current members and returning clients get a $50 gift card. The $50 gift card available to current members is not valid towards membership dues. 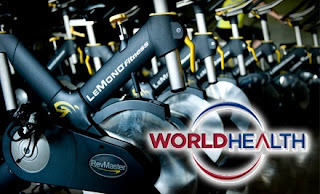 World Health is an adult-oriented private health club whose staff stays on top of the latest trends in health and fitness through continuing education. With today’s deal, new clients can strip-mine their wealth of knowledge during two one-on-one personal training sessions with a fitness professional, and sweat it out en masse during a group fitness class, such as the fiery, Latin-dance-inspired Zumba. See each location’s class schedule by selecting an Edmonton location in the drop-down menu here. Depending on the amenities available at members’ chosen locations, they may expunge unwanted calories solo on treadmills or circuit-training weight machines, retiring afterwards to sip succulent nectars through their bills at a juice bar or purge plugged pores in a steam room. Returning clients may use their gift cards for cups of ice-cold juice, personal training, or for registered programs that build higher-level skills over several progressively harder sessions, among other options. Though individual locations have yet to receive many reviews, World Health boasts more than 1,200 Facebook fans nationwide. This is a limited 3-day only sale that will expire at midnight on Thursday, January 6, 2011. Click here to buy now or for more information about the deal. Quantities are limited so don’t miss out! Includes 8 sessions of instruction in the Foundational Course with unlimited access to the gym for 4 weeks. Can start class any week of the month (not progressive). Limit 1 per person. Unlimited gifts. Call to register for classes. Get motivated to work out in a language that you can actually understand, and make your New Year’s get-fit resolutions a reality with today’s TeamBuy: for $35 you get 8 sessions of instruction with unlimited access to the gym for 4 weeks from CrossFit Lazarus. Like what its name means – a resurrection – CrossFit Lazarus is ready to get your body into high gear instead of its flat-line status on the couch. CrossFit Lazarus is Edmonton’s newest CrossFit gym and is focused on training individuals as well as groups to overcome their self-imposed limitations when it comes to their physical fitness. Everyone from grandmothers to professional MMA fighters to soldiers can benefit from the CrossFit program. The quick workouts are perfect for those on-the-go and who don’t have a lot of time to devote to fitness regimes; you can easily be in and out in 45 minutes. In order to bring your fitness regime back to life you’ll definitely need a good instructor, and there is no one better than the trainers at CrossFit Lazarus. Owner and trainer Richard Bodnaruk is a veteran of Task Force 309 Kandahar Afghanistan 2010, as well as having 4 ½ years of CrossFit training. Both himself and fellow owner/trainer Peter Li joined the military at age 17 and have been using the CrossFit methods that militaries around the world have adopted into their physical training regimes. Every workout has the ability to be scaled down to a level that all individuals can understand and benefit from. The strength and conditioning program focuses on building fitness that prepares you for all the unknown applications that life can throw at you. Progressions are available for all exercises, so you’ll never get bored as you learn more and more. And better yet, you’ll have the motivation of those around you to push yourself to achieving all your fitness goals. 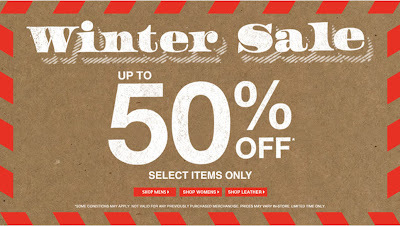 Roots Canada currently has a Winter Sale where you can save up to 50% Off select items only. There’s a large selection of men’s and women’s merchandise on sale. This is a limited time only sale and is available in-store and online. If you’re shopping online, Roots Canada offers free shipping on orders of $100 or more. Click here to shop Root’s online now or for more information about the sale. This is a limited 1-day only sale that will expire tonight at midnight (Monday, January 3, 2011). Click here to buy now or for more information about the deal. Quantities are limited so don’t miss out! Limit 1 per person, may buy 1 additional as a gift. Limit 1 per table. No cash back. Tax and gratuity not included. Not valid with other offers. 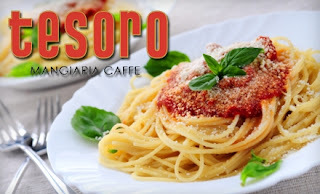 Today’s Groupon: for $20, you get $40 of authentic Italian coffee and cuisine at Tesoro Mangiaria Caffe in Oliver Village. Fusing delicious Italian fare with bold coffee and delectable pastries, Tesoro treats the hungry populace of Edmonton to tasty breakfast, lunch, and dinner dishes from the confines of its sleek yet romantic eatery. The menu of bean-brewed beverages and authentic cuisine serves hungry stomachs with delicious cease-and-desist papers. Roasted chicken breast pollo pesto panini ($11.50) and spicy soppressata-topped calabrese pizza ($13) beg for caffeinated accompaniment, such as a caramel latte ($3.75) or macchiato ($2.25). During the warmer months, Tesoro invites patrons to sip their sultry beverages on an outdoor patio, presenting famished guests with relaxed dining options while educating the local lynx population on proper table etiquette. It looks like The Source has extended their Boxing Week where you can save up to 70% off select electronics. I took a look at their online flyer and there’s a couple really good deals, but I’m currently not in the market for any electronics at the moment. Click here to view their online flyer for more information about the sales. Gap Canada just sent me an email about this sale. 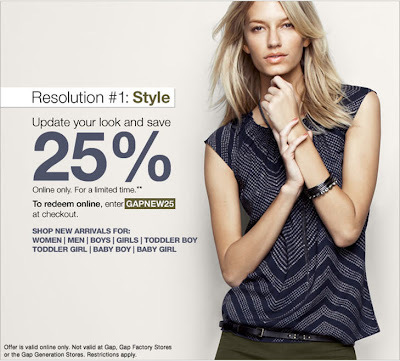 From now until January 5, 2011, save 25% off everything when you shop Gap online. Simply enter the discount promo code “GAPNEW25” at checkout to get the discount. Gap offers free shipping on all order of $50 or more and offer free returns on all orders as well. Offer valid from January 3, 2011 12:00 a.m. ET through January 5, 2011 at 11:59 p.m. ET. Offer valid in Canada only on Gap merchandise purchased online only. Not valid at Gap, Gap Factory or Gap Generation stores. Not valid on sale merchandise. Discount applies to merchandise only, not value of GiftCards, packaging, applicable taxes, or shipping & handling charges. Not valid for cash or cash equivalent. Offer is not transferable and cannot be combined with other offers. No adjustments on previous purchases and subject to change without notice. Offer is not valid on international shipments. Click here to visit Gap’s website to shop now or for more information about the sale. Similar to Best Buy, Sears has extended their Boxing Week sale until January 9, 2011. I believe the sale is only available online. If you didn’t get a chance to visit Sears on boxing day, here’s you last chance to pick up some good deals on home appliances. At the time of this post, they had 283 different items on sale. Click here to visit Sear’s website to view the sales. 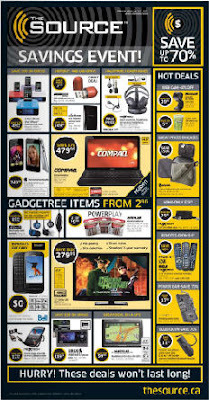 Best Buy has extended their Boxing Week sale until January 6, 2011. The sale is available in-store and online. They have a large selection of electronics at drastically discounted prices. Did you buy anything at Best Buy on boxing day? I ended up picking up a 13′ Macbook Pro for $150 Off and 4GB Xbox Slim for $129.99. Click here to visit Best Buy’s website for more information. I would like to wish everyone a happy, healthy and prosperous new year! 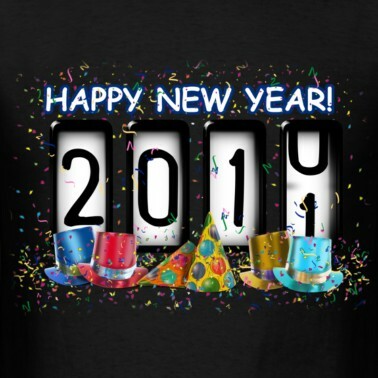 Thanks for helping make 2010 such a great year for Edmonton Deals Blog. Thanks to your support, we’ve been able to grow very quickly in a short period of time. I have some exciting news and a lot of free giveaways coming soon so stay tuned! Thanks for reading and supporting Edmonton Deals Blog!